A robotics company known for its widely shared videos of nimble, legged robots opening doors or walking through rough terrain is preparing to sell some after years of research. 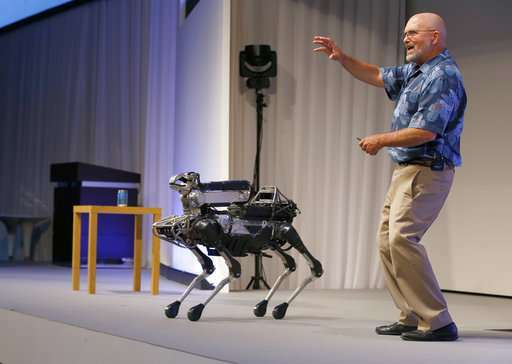 Boston Dynamics CEO Marc Raibert says his company will begin selling the dog-like SpotMini robot next year, likely to businesses for use as a camera-equipped security guard. He made the announcement Friday at a TechCrunch robotics conference at University of California, Berkeley. Founded in 1992, the company rarely reveals its plans except by posting YouTube videos that have impressed and terrified people. Google bought the Waltham, Massachusetts, firm in 2013, then sold it last year to Japanese tech giant SoftBank. Raibert says he's also looking at deploying the robots in construction work. He wouldn't reveal how much they will cost.